Bread has a religious significance on the Italian Easter table, for Christ is often referred to as "the bread of life." 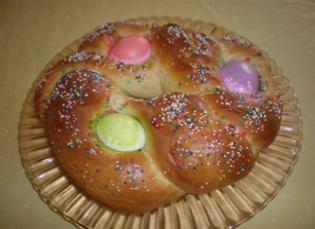 Hand-fashioned egg-decorated breads vary from region to region in Italy and go by many different names. But the commonality of baking whole eggs twisted or braided into bread is part of the theme of Easter; eggs being the symbol of rebirth. According to tradition, the egg represents the origins of life, rebirth, hope, and new beginnings. 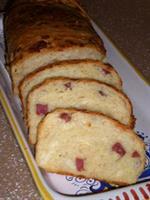 Eggs are abundantly present in Italian Easter breads and sweet and savory cakes of the season. The unquestioned symbol of Easter throughout Italy is the chocolate egg. They are usually hollow, often with a gift inside. Their heights range from a few inches to several feet. The chocolate eggs are traditionally wrapped in a bright, colorful foil fanned out in a beautiful display and sometimes embellished with ribbons, bows, and flowers. It is thanks to the famous chocolatiers from the Piedmont at the end of the 1700's that we owe the creation of the first chocolate Easter egg. 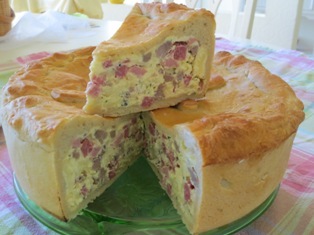 Pizza Chena, sometimes pronounced "Pizza Gaina," is a southern Italian savory "full pie" with a variety of cheese, cold cuts, and eggs encased in a bread crust. The lamb, representing innocence and the sacrificed Christ (the lamb of God), is referred to as the Pascal lamb. It is the meat of choice on an Italian Easter dinner table. The often-elaborate lamb-shaped Easter cake can be found as the centerpiece on many Italian Easter tables. We provide you with step-by-step photos for decorating your lamb cake. Bolognese rice cake is served as a celebratory cake and is very typical during the Easter season. Fiadone or ricotta pie is a typical Italian dessert is often served as an Easter specialty in southern Italy. The flavorings vary according to region. This recipe for fiadone has a custard-like filling with a delicate lemon flavor. Colomba di Pasqua is a traditional Italian Easter yeast bread. It is shaped like a dove (colomba in Italian), the symbol of peace and resurrection. Pastiera, the ultimate Neapolitam Easter dessert, is a sweet and creamy custard pie with whole grain wheat berries and bits of candied orange and lemon peel suspended inside a lattice-topped pastry crust. Casatiello is a rich savory bread filled with meat and cheese that is a traditional Easter bread from Naples, Italy. Pardulas look like a pastry chef's version of the rising sun on Easter. They contain very little sugar and the saffron gives them a slightly tangy flavor. Many people throughout southern Italy give La Pupazza con l' uovo, the doll with an egg, as a traditional Easter gift, especially for children. These cupcakes are perfect for Easter or any springtime party. Kids of all ages can have fun with the decorating. Italian pastry shops have an array of lamb cakes available at Eastertime. Some are filled with almond paste and others have candied fruit and nuts in the batter. 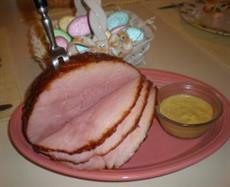 Make one as a certerpiece for your Easter dinner or brunch table or to give as a charming gift. Pizza di Crema is a custard pie that is Neapolitan in origin. 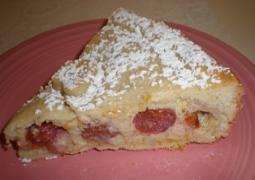 Pizza di Crema has a custard filling flavored with orange zest, cinnamon, and vanilla and enhanced with cherries. 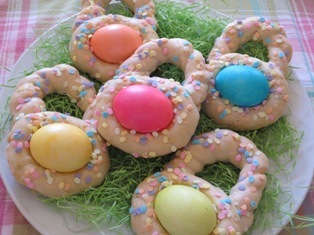 These large cookies are shaped like Easter baskets, brushed with a sugar glaze, dusted with candy sprinkles, and have a colored hard-boiled egg embedded. Tuscan sweet buns made with bread dough, olive oil, raisins, and rosemary. Similar to hot-cross buns, they are traditionally eaten on Holy Thursday. These simple ricotta pastries from the Abruzzo region contain a sweet and creamy filling made with ricotta, eggs, and lemon zest enclosed by a delicious crust made with olive oil. Each Prosciutto is treated individually, taking the necessary time and care to ensure consistent quality and flavor. Let your genuine, true faith shine out with this expertly handcrafted solid gold crucifix pendant. It is solid 14 karat yellow gold in perfect polished finishand made in the USA. This would make a memeorable gift for a special occasion. This Pendant is crafted from 925 Sterling Silver. It comes in a high polish & diamond cut finish. The pendant is available with an 18" Sterling Silver Italian box chain (for additional price). This pendant comes from the Dream of Eden series. The green leaves symbolize hope and rebirth. It would make a special gift for a mom, wife, young girl, girlfriend, best friend, daughter or yourself on Good Friday, Easter Day, a birthday, or for someone going through a difficult time. For over 200 years the Pfaltzgraff brand has been associated with the highest quality ceramic products available for the home. This eye-catching pattern of colorful flowers that circles each piece in this collection will make every occasion a bright and delightful experience. What makes Corelle Livingware so durable and versatile is vitrelle brand glass, composed of a unique, technologically advanced material. Like the first blossoms of spring, the single chain of cornflowers coordinates well with other Corelle patterns. This Easter Cake is shaped like a dove, symbolizing peace and many legends tell how it was created to convey a messsage of tranquillity to family and friends. To ensure that this delicacy is This delicious cake is generously laden with candied orange peel and is made with Carli Olive Oil as opposed to butter. Made for sharing with all of the women you appreciate having in your life. There are 51 - two sided, playing card size, inspirational messages in a box. Give all at once to draw from for a 'lift', or keep a box to tuck a blessing into a lunch bag, briefcase, travel bag, pocket or purse. This pie has a sweet and creamy ricotta filling with mini chocolate chips added and just a hint of orange on a Pasta Frolla crust. Ciambellone (some call it ciambella) is a ring-shaped dessert usually flavored with lemon. 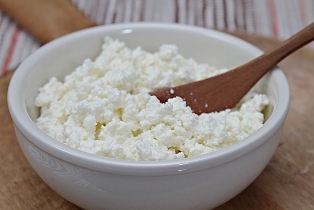 Often served for Easter it is a nice, simple cake that can be served for breakfast or dipped in sweet wine at the end of a meal. Bellino - Italian Dark Chocolate Egg, (2)- 5.3 oz. Pkgs.